In Part 1 of our deep dive into why we sold our brand new 5th wheel RV and bought a really old Airstream that needed to be renovated, we talked about simplifying, learning to do our own repairs and cutting down on our length, height and weight so that we could boondock and camp off the grid more. After a year on the road we realized we wanted even less of the mainstream camping experience - and more secluded and sustainable adventures. Part 2 explores in detail the final reasons we decided to go down this path. Driving forwards with a long rig is actually pretty easy. Our 2002 F350 didn’t feel like it was even trying most of of the time. It was easy to forget it was back there. Turns are tricky because you have to take them really wide or you’ll hit a curb (or something worse) with the back end of your rig. That 37 feet behind us caused quite a few close calls over the last year. And of course, backing up something that big with an older truck that has a poor turing radius and a long bed meant lots of frustration getting into spots. 5th wheels move in their own special way and even 16 months in I still didn’t feel like I had quite nailed it. Now, I knew that bumper pull trailers were more maneuverable, and though I’ve only backed the Airstream up a couple of times I could tell a big difference. It’s much easier to push where you want it and make small tweaks and corrections on the fly whereas with the 5th wheel you almost had to start over if you didn’t get it in the right place the first time. What I didn’t expect was how much better the Airstream pulled and turned going forward. I was consistently surprised how well it followed us around tight turns and just barely even felt like it was there. Add to the fact that it weighs half of what the 5th wheel weighed and - let's just say it tows like a dream. For fun we took it through some parking lots and crazy turns and it performed admirably. I’m going to be a lot less stressed about getting this one stuck somewhere. If you’re boondocking, power is a major concern. For those new to the wild and wonderful world of RV electricity, your rig has two types of power. DC (12 volt) and AC (120 volt). When you’re plugged in at a campground you are powering your whole rig with 120 volt power. It’s pretty much like at home. Outlets, lights, fans, air conditioners, big appliances all run off that power. But when you unplug the system it switches to your battery power and converts to 12 volt. You’d be surprised what you can run off 12 volt. All the lights and fans work - and appliances like your water heater and refrigerator switch to using 12 volt and propane. What won’t work are big appliances like your Air Conditioner - or any of your regular power plugs. Our huge 5th wheel came with one tiny deep cycle marine battery. We could barely make it overnight running a few fans and lights before we needed to recharge it. This made boondocking difficult to say the least. We ended up buying a pair of Honda EU 2000i generators that chain together to produce 30 amps of continuous power. This let us run our electrical outlets and charge the batteries. But the hum of a generator isn’t very awesome when you're in the pristine wilderness. And they’re a pain to get out, setup and keep running for long periods of time. We knew if we were building our own off-the-grid traveling home, we needed something more powerful, eco-friendly, manageable and quiet. That something was solar power. It’s a lot more complicated to setup than buying generators, but having a system that is constantly recharging itself and giving you ample power is pretty amazing. We’ll have 500 watts of solar panels on the roof and a 400 amp hour lithium battery bank inside. We may add a ground deploy panel at some point if we feel like we need it. Lithium batteries have numerous advantages over the old lead acid deep cycle marine batteries. I won’t go into great detail, but basically they are smaller, lighter and you can actually use the amp hours you have. We’d have to get double the amount of marine batteries and they already are much larger and heavier. Basically, they would have been to large and heavy to even fit in the Airstream. With a large lithium battery bank we can store up energy for cloudy or rainy days. And the 500 watts of collectors on the roof means we can fill up that battery bank as quickly as possible. We’ll be able to run our electrical outlets, work on our computers and watch TV without any problem. Some appliances like the Air Conditioner still won’t work, but with the smaller Airstream, better insulation and plenty of windows for air flow we should be just fine. Even more exciting, we should be able to do all this in the middle of nowhere. We’ll always have power no matter where we are. Whooo!!!! And of course, if we are stuck somewhere with no sun and lots of rain for too long we can always get the generators out and charge up the batteries, too. Sewer hookups were another issue for us with the 5th wheel. We could go about a week before needing to dump our waste tank. And man did it get stinky near the end of that week! Flushing toilets use quite a bit of excess water - so not only were we filling a black tank we were depleting our fresh water tank, too. Finally, we had to “flush” the black tank every week. This involved filling up and dumping it at least 4-5 times till water ran out clean. It took quite a bit of time (and water - 40 gallons x 5 each time! ), and I was always worried about overfilling the tank and spraying poo out our roof vent. Composing toilets are a little controversial, but they are great for boondocking. Did you know that sewage is only created when your poo and pee mix? I didn't. Composting toilets separate this for you - and they don’t flush so you’re saving your fresh water. Urine can be disposed of safely and it turns your poo into compost that you can dispose of just about anywhere. And best of all, you don’t need a blackwater tank ever again! Another benefit is that we are going to be able to convert our black tank into a gray tank so we can hold more shower and dish water before we need to find a dump station. Composting toilets are a great way to simplify your tank and water usage - and allow you to stay off the grid longer. Initially our plan was to buy a newer used Airstream and add solar and composting. We spent months trying to find the right one and had no luck. The used market prices started skyrocketing and we really wanted to use the money from selling the 5th wheel and break even on the whole thing. Also, we wanted to love the Airstream and not end up with one that had carpet on the walls and looked stuck in the 90’s. After much deliberation we decided to get something significantly older (and cheaper) to do a custom renovation. 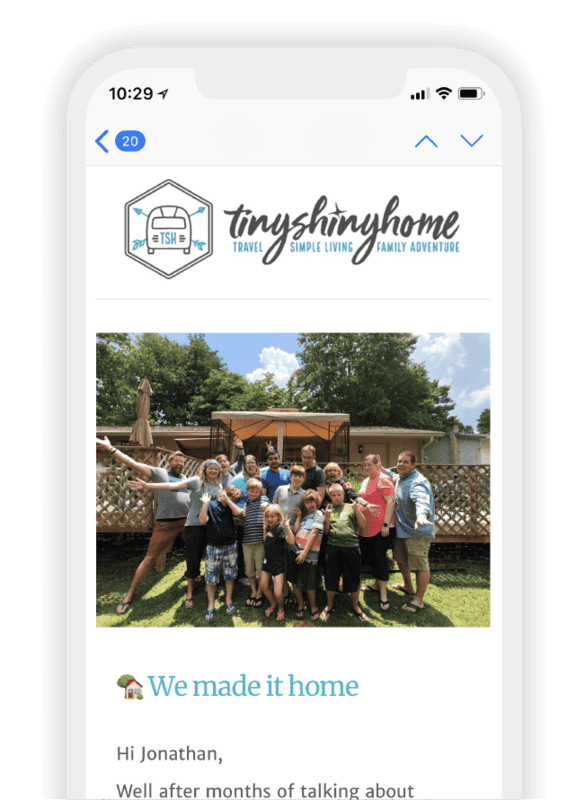 In all reality, even a newer Airstream would have issues and by doing a full reno down to the studs we could replace everything inside and know that it was done right for less than what even a 10 year old Airstream would cost. Having 4 kids meant we’d be modifying heavily either way. Might as well make it exactly the way we wanted it. Plus, we had an ace in the hole. Ashley's Dad, master of all things construction agreed to help us through the process at their house. So we would have an expert guiding us and a place to stay while doing the renovation. This never would have happened without Ashley's parents. They rock! Finally, you should know that RV’s don’t appreciate in value like a house does. Since we don’t have a house anymore, we weren’t gaining any equity in anything. That brand new RV we bought a year ago? If we hadn’t done a ton of extra customization to it we would have sold it for a lot less than we paid for it. 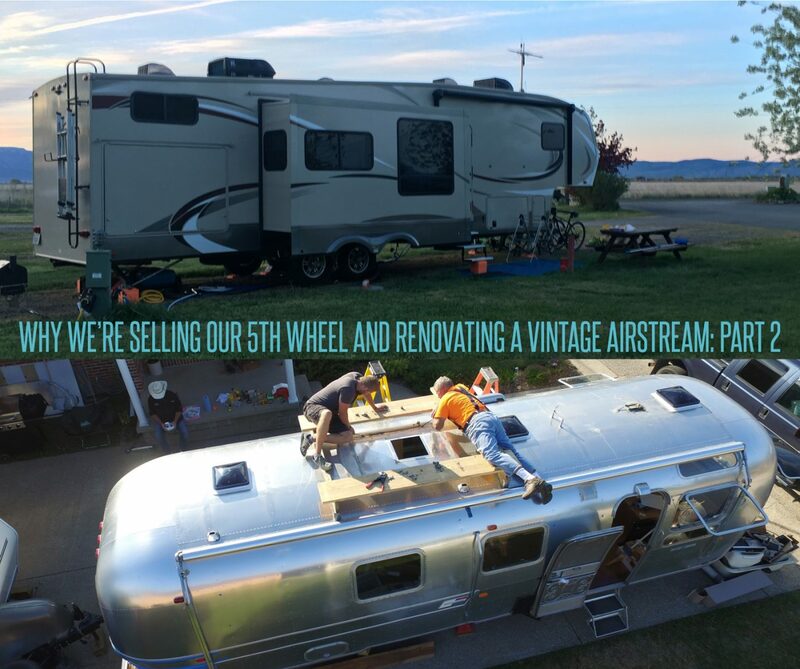 But a vintage Airstream that’s been fully renovated and remodeled? Turns out they do appreciate in value. And they appreciate quite a bit. We know a couple that had theirs appraised at triple what they put into it. Say what?!? We don’t know for sure how ours will appraise when we’re done - so we’ll follow up with more details when we can. But for now we feel like buying vintage and fixing up will give us much more equity than any other RV we could have bought. Whew! This turned out to be a small novel didn’t it? This is why it’s hard for me to give people a straight answer when they ask us why we sold a new RV and bought an old one to fix up. So many reasons! So many moving pieces and stuff to explain! See we’re not that crazy after all :).